My all time favorite cookie is Oatmeal Raisin. I've never been a huge sweets fan, preferring savoury treats but put a tray of these cookies in front of me and it's game over. I've tried out dozens of oatmeal cookie recipes without much luck but this recipe from Simply Recipes is always fantastic. I made these for my mom the other night knowing full well that she doesn't eat cookies, ever (ice cream on the hand is another story!) I wanted to see if it was just me who couldn't resist them. So I baked a batch, put them on the table and walked away. A couple of hours later I went to check on my experiment and just as I suspected, they were all gone! I feel kind of bad now, I've pulled someone else into my oatmeal raisin cookie addiction but for the sake of my waistline, I needed a companion, sorry Mom. Preheat oven to 350 degrees. Cream the sugars and shortening together in a large bowl. Add the eggs and vanilla and beat well. In a separate bowl sift the flour, salt, baking soda and cinnamon together. Add the butter and sugar mixture to the flour mixture and mix well. Mix in the raisins and nuts. Add oats, mix gently. Spoon the cookie mixture by tablespoons onto a greased cookie sheet. Bake for 10-12 minutes, remove from oven and allow the cookies to cool on a rack. 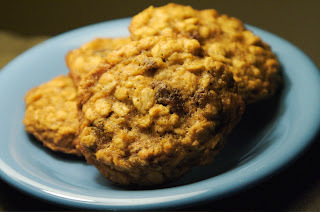 I always use the Quaker Oat Recipe, these look so good, I may try them next time! I really love these cookies. They always turn out awesome. You're right though, the Quaker Oat recipe is great too!